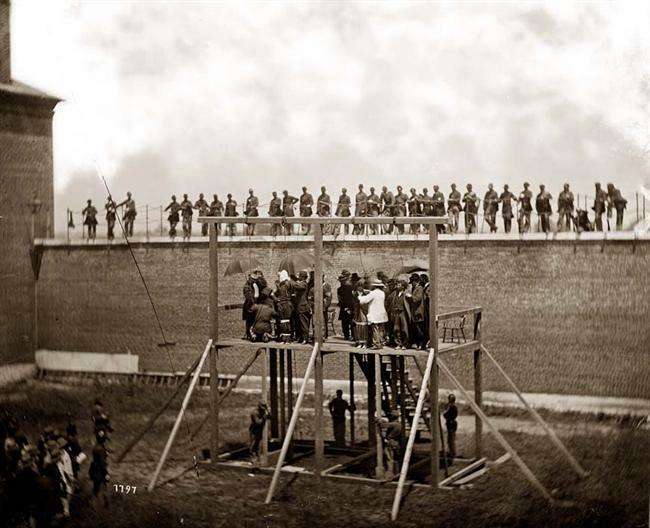 Alexander Gardner did a classic job when he photographed the Lincoln Conspirators and their Execution. Can I use your nice photos in my blog under your name ? Hi Sara: Certainly you can. These photos are all in the public domain and I have just gathered them from various sources. Thank you for asking. That’s very kind of you. Mr. Gardner took a photograph of J.Wilkes Booth in death also aboart the ship just after the autopsy. Has that picture every surfaced? Hi John: Alexander Gardner was invited by the War Department to take a series of photographs to record the autopsy of John Wilkes Booth on April 27, 1865. Booth had been cornered and killed the day before on April 26. His body was transported to the Washington Navy Yard and brought aboard the ironclad monitor USS Montauk. At 2:00pm that day, his autopsy was performed and Gardner took the pictures. However, once the photos were completed, the glass plates were taken and delivered to the Secretary of War, Edwin Stanton. It was Stanton’s order that no photographs be used publicly to ‘promote’ Booth in anyway. Since that day, these photos have never been seen and may be lost to history. Some scholars are hopeful that perhaps one day they will be found but at this time, they may just no longer exist. I thank you for your question, John. Timothy O’Sullivan was the Assistant who was with Alexander Gardner when the Hanging Photographs were made. Hi Arnold: You are correct. Timothy O’Sullivan was one of several photographers that worked with Alexander Gardner during, and after the Civil War. Like Gardner, most had started their careers working for Matthew Brady. But Brady would take credit for these photographs by signing his own name to these photographers’ work. In 1862, Gardner left Brady and opened his own studio. Many photographers who had worked for Brady began working for him. But unlike Brady, Gardner credited the photographers who worked for him. In the case of Timothy O’Sullivan and the Lincoln conspirator photographs, O’Sullivan did indeed assist Gardner. However, O’Sullivan not only assisted Gardner on the day of the executions, but he also assisted on April 27, 1865. On this day, they were invited to the Washington Navy Yard where they photographed John Wilkes Booth’s autopsy. As well, they took a series of pictures of 7 prisoners (6 of which who would eventually go on trial along with 2 others jailed elsewhere). The photos of Booth’s autopsy have been lost to history but the conspirator photographs exist. To see many of them, go to https://awesometalks.wordpress.com/chapter-3-the-lincoln-conspirators-execution-photos-a-study-in-detail/. I have been watching the history channel on the Lincoln Assination. 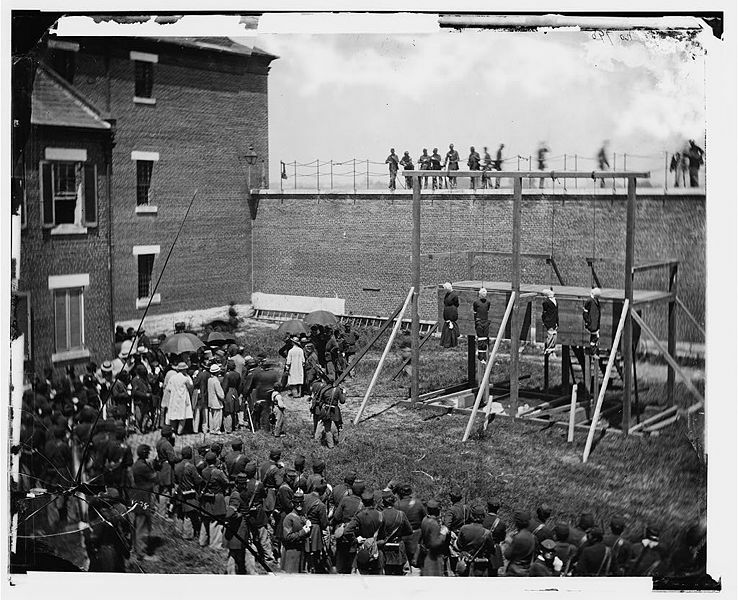 The conspirators were hanged on what is now known as Ft McNair-War College. Part of one of the buildings that you see in these photographs still exists. Ft McNair say’s that they have preserved the building and that is called Grant or building 20- and where the hangings took place is where there are currently tennis courts. I have seen pictures of building 20 and see the tennis courts but can not figure out if they took most of the old building and left just a piece of it or what? Curious because I am wanting to know what is left of this history? Hi Laura: Thanks so much for your comment and question. I am in the middle of working on an article on just that subject but need to complete some of the other projects first before I can get to it. So much great stuff, so little time. If you go on Google Earth and zoom and search for Fort Lesley McNair it will take you to the area. The tennis courts are just south of where Google Earth actually drops you in. There is a building just to the right of the tennis courts but I have been having trouble matching up that building to the building shown in the execution photos. Something doesn’t quite line up. So part of my research will be to determine if that is in fact the building (Grant or Building 20) that they refer to. I’m sure it’s a fairly simple answer but just haven’t had time to look at it whole story closely. If you go onto Fort Lesley McNair’s website, the history of the site is general and spans over three centuries. Please let me know if you discover more abou this as I’d like to hear as much as possible about the location. Thanks for getting back to me…..When I wrote you, I was looking at the google earth picture…..it’s a sort of small building with the tennis courts to the right of it along with parking lots (how I was looking at it). In looking at the old pictures of the execution, there is the building that is behind the gallows that is quite long and another one that has been identified has a place where the photographer took pictures from the second story. At first I was thinking this is the building 20 that is in the history section of Ft McNair and currently standing, but am not sure…pictures and angles don’t match up…let me know anything you find and I will do the same. I have spent hours on the net looking in to what’s left…I’m tempted to call the fort and ask someone!!! Hi Laura: Thanks for the response. I am pretty certain you are correct that the building to the immediate right of the tennis courts is not from the original construction. There are similar buildings of the same design all around that area. Now if it is part of the original building, I can’t determine how the orientation works with the tennis courts (if that is in fact the area where the scaffold stood). I’m sure someone has these answers and it will all make sense once they weigh in. I’d start with the Public Affairs Office Fort Myers. I believe they handle Public Affairs for Fort Lesley McNair. If you do contact someone there and you can track down who to speak with, please please please let me know as I’d love to post the results of your research. I appreciate your help on this one until I get a chance to look into it further myself. I thought that I would try and help clarify the questions regarding the Gallows site at Ft.McNair. I had a chance to visit the site 2 years ago. The only remaining structure (everything else was demolished in 1867-1868) is known as Building 20 – Grant Hall. This structure now houses The Center for Technology and National Security policy. The facade has been redesigned and changed many times over the years and is almost unrecognizable from the Gardner photos. In 1831, an eastern extension to the building added a women’s ward and quarters for the deputy warden. It is my best guess, that the building which is still standing is the one in the Gardner photo that comes out from the wall and looks like a small house jettisoning out from the other buildings. So, the tennis courts to the side of the building is where the gallows were. I was given an informal tour of the building by one the employees. This building is where the actual trial took place. Barry, I am sending you photos I took as well as a sketch which may explain the google earth image a little better. North is to the left of the map so the scaffold would be right about where the road is east of bldg. 20. Hi Wayne: Thanks for writing. It took me a couple of minutes to figure out how you came up with your conclusions. The location of the scaffold is, in fact, on the tennis courts just off the playing surface of court number 4 (the most eastern located court). Your description of north, south, east and west are correct so your orientation was right, thus confusing me for a couple of minutes. And then I realized where you went wrong. The two story building that you refer to in the old photos is not Building 20. That building was the old hospital extension built into the south yard off of the main penitentiary building. In 1867, the penitentiary was demolished except for the two outer ends of the main penitentiary building (one at the east end (Building 20 or Grant Hall) and one at the west end (which was later demolished in the early 1900s). Building 20 is all that remains from the original penitentiary building. It is approximately 44′ wide x 50′ deep. If you reorient yourself based on this new information, then you will see that the scaffold location falls on the current tennis court. I work at the Washington Navy Yard and went over to McNair and lunch today to see the site for the first time in person. I took a couple pictures of Bldg. 20 near where the historical marker is and one in front of building 20. The best one is from the south of building 20 at the same angle but lower than the execution photo taken from the south. Like somebody pointed out the chimneys and a few of the windows are the only way to match up the buildings. I was clearly wrong about the building jutting out of the long warehouse looking building (kind of reminds me of the Warehouse at Camden Yards in Baltimore) being bldg 20. In the execution photes I’d say the scaffold lines up perfectly with the first column of windows, and this column of windows is still there between the two chimneys plus many new windows that weren’t there in 1865. I wish I could post the picture here, but I’d say from my photo, and coming out from this column of windows would put the scaffold just barely outside the easternmost tennis court in a grassy area. Hi Wayne: I like your enthusiasm for this subject. Two years ago when I started on my research of this event for our upcoming book, I had similar questions about the location of the scaffold. But now, many moons later, having joined forces with researcher John Elliott we are 100% confident of the final location of the scaffold being on the out of bounds area of tennis court #4. The grassy area you speak of would put the gallows too far to the east. I truly applaud your analysis and I’m sorry that I can’t share our research with you at this time until the book is release next spring but we have done our homework. We have obtained and analyzed the architectural drawings from the penitentiary, forensically analyzed the execution photos and triangulated the camera angles, spoken to photography experts on distortion due to camera angles, visited Fort McNair numerous times and shared our work with experts including historians and staff from Fort McNair and the Lincoln Assassination research community. It is pretty overwhelming evidence that will show that the scaffold would today, sit on the tennis court. Please feel free to send me your photos at outreach@awesometalks.com and I’ll be happy to look at them. And don’t lose your enthusiasm for this. When the movie, The Conspirator is released this spring, the interest in the subject is going to get large and you may be one of the few who can talk about it to people wanting to know what really happened on July 7, 1865. Ho there- laura here again…have not visted this site in a while. Thanks for the above post. For my clarification….the picture where you can see a building to the left, and it was stated that some of the pictures were taken from that spot…and I believe that the photo taken on top of the wall you can see people standig on top- is that Building 20? The above post was great…I feel a little opsessive, but am not really curious of what building and which one it is in the old pictures!!! Hi Laura: I haven’t forgotten you. I’ve just been so busy with other work and interviews that I haven’t had an opportunity to address this question fully. A gentleman by the name of John E. sent a comment to me earlier this month. Although his initial comment was slightly incorrect (he was missing some current information) but once we had a chance to talk and revise the info, his information and mine combined to get you your answer. Building 20 or Grant Hall is the one to the north of the tennis courts. John E. visited Ft McNair about 2 or 3 years ago and sent me some great pictures. I will send them to you by email but will post the photos that John E. sent me in a future article once my time frees up. I’m glad we could assist you in this question. I have realized I can’t type- I was looking at the pictures above again- the last picture of the ones above, you see a building to the left..two stories and top window is open…this window faces the gallo’s…is that building 20? You mentioned that they have added and changed it around because I saw no likeness to anything as it is now….in that picture, you never see awhole building so I am unaware how big it was to begin with…but as you said, the ones closet to the gallo’s were torn down?? Hi Laura: See the answer below. Every building you see in photo 10 (The last one) was demolished and no longer exists, with the exception of a portion of the building that has part of the long wall attached to it. The wall was taken down and the end of the long building was spared. This is where the trial was held. I initially thought that the portion of the building that stuck out and looked like a little house was the part still standing. That’s not correct. I don’t believe Building 20 was ever used by Gardner to take photos. I may be wrong. I think Barry will post some photos that I shared with him that may help clear things up. Specifically, after one of the first remodels, the double chimneys on the North and South side of the building remained. This will help with the perspective. Please remember that Building 20 has been remodeled quite a few times and bares no resemblance to the old arsenal.–The rooftop especially. Hey John. Good to hear from you again. You are quite correct. I will be posting your photos soon but have run into a backlog of interviews and ‘real work’. Hang in because I really do want to share them with everyone. But to address your comment about Building 20 not being used by Gardner, you are correct. The building Garnder used to take 9 out of 10 photos was on the west side of the yard and was not one of the buildings that survived when they demolished most of the penetentiary. If you are looking at the photo called Rooftop View, Building 20 is the portion of the building that is just to the left of the prison brick wall. When I post the photo of the prison floorplan that John overlayed onto a current image of the site (Google Earth) you will see the correct orientation. Good work John on that one! Thanks so much for getting back to me….So, only a portion of the building attached to the wall remains..and yes-it has no resemblance to the google earth picture. I will wait for the pictures to be posted-can’t wait to see them! Hi Laura: Did you not receive the pictures I sent you today from John E? If not, I will send them again. The prison where Mary Surratt and Dr. Mudd were originally kept (before being moved with all the other conspirators to the Washington Old Arsenal Penitentiary) was at the Old Capitol Prison at 1st Street East at A Street North and Maryland Ave NE all converge. That small block is directly east of the Capitol Building grounds. This is indeed where the US Supreme Court grounds are today. You can see the buildings in old maps of Washington DC from 1857 and 1861. Go to the Library of Congress on-line Maps section and search District of Columbia maps. They have a zoom feature where you can look at both Ft. McNair and the Old Capitol Prison up close. Within 35 years of the executions, much of the Washington landscape changed It’s quite a lot of fun to look at these old maps and see what you can find. NOTE: Don’t take any one map as being ‘gospel’. Most have errors. Some have glaring errors. For instance, the location of the actual Old Arsenal Penitentiary grounds is often wrong. It was located in the middle of the penisula between T & U streets and not down at the southern end of the penisula at Greenleaf’s Point (this is shown in several maps as the location but they are incorrect). Two of the better ones is the published map in 1861 titled “Topographical Map, District of Columbia, Surveyed in the years 1856, 57, 58 & 59 by A. Boschke” and another one dated 1957 but I didn’t keep the name of the publisher. Both locate the Arsenal penitentiary in it’s correct spot. They also have some 3-D maps from that era. It’s a really great place to explore on-line. It’s not as easy to navigate as the Prints and Photographs section but once you are in, you may spend hours there. I’ll send you some examples from that map so check your email. I recently started a job at NDU and now work in building 20. There is talk of a renovation to include restoring the top floor to its tribunal set-up. The building is pretty neat with alot of fancy woodwork (and detail) from the late 19th century. I’d love to see your pictures side-by-side with the ones in this blog. Hi John: Thanks for the info. I’d love to hear more about the building and share it with my readers. Hi, I recently purchased a home in Anderson, Indiana without knowing that it was historical and why-come to find out that Mary Surat(that was the spelling I was given) owned this home and that President Lincolns assassination was planned here. I can not find any information on the internet to verify and would like to know if you could lead me in the right direction on where to look. Also I would like permission to print out the pictures on your website-strictly for my own personal use concerning the history of my home. Thank you and I look forward to hearing from you. Hi Angela: Thanks for writing. Well, that sounds exciting. From what I know about the assassination, it was planned between March and April, 1865 in the Washington/Virginia/Maryland area. I am not aware of Mary Surratt ever living in Anderson, Indiana but I am not as familiar with her early life as Laurie Verge, the Director of the Surratt House Museum in Maryland. I’ve forwarded your message to her and will post her response as soon as I get an answer. But there is a definite connection to the Lincoln assassination, Mary Surratt and Anderson, Indiana. A man by the name of Louis J. Weichmann was living at Mary Surratt’s boarding house at the time of the assassination. He knew many of the conspirators and John Wilkes Booth. Later at the conspirator’s trial, he testified against Mary Surratt and is credited or blamed as being the main reason why she was the first woman to be executed by the Federal Government in the United States. He moved to Anderson, Indiana later in life, eventually dying there. He is buried in St. Mary’s Cemetary beneath the tombstone under his original European name of Wiechmann. Could you be the new owner of Mr. Weichmann’s home? Please contact me at outreach@awesometalks.com and we can discuss it further. MY GREAT GRANDDAD WAS AT THAT NECK TIE PARTY…HE SAID THAT HE DUG THE GRAVES.. BUT HE DOES RATTLE ON A LITTLE WHEN HE GETS HIS GIN AND JUICE GOD REST HIS SOUL…. Hi Johnny: That’s awesome. What was your great grandfather’s name and regiment? The men who dug the graves were asked to volunteer because no one could be ordered to do the work. I’d like to hear more about your great grandfather and some of the stories he told you. It would be great to share these stories with my readers. Hi John: LOL. You may be right. But the subject is the mainstay of my research. Hi Sara: So sorry that I didn’t get back to you sooner. I was on the road over the last week and a half. Regrettably Sara I can’t confirm that Gardner’s photos had any direct impact on photojournalism. Certainly back in the 1860’s this would not have been the case as the technology for reprinting photographs for the newspapers wouldn’t be available for another 30 years. However, wood cut prints were made from his photographic images and these certainly helped to promote the stories of the executions. So in a roundabout way, yes, the Gardner photos did have an impact on using images to tell a story. In the 1990s, only 4 photos from this series were known to exist. But by the early 2000’s 10 images had come to light. I’m actually trying to track down an 11th. I personally believe that Gardner, and his assistant Timothy O’Sullivan, could have taken between 16 to 20 shots of the event that day. Some of those missing photos may not have developed properly or perhaps the glass plates broke and rendered them useless. But I believe that there were more taken than just the 10 we currently know about. Contemporary woodcuts exist that point to the possibly that they were replicated from some of these photographs. It’s an interesting puzzle. The full set of images are not carried on any other websites that I am aware of. But if you go to the Library of Congress’ Prints and Photograph section on line, do a search of Alexander Gardner and any images that he has taken which the LOC has scanned will come up. 9 of the 10 images are on their site. Also, do a web search on Harper’s Weekly and Lesley Illustrated publications. These were two of the major papers that published woodcut images in quantity during the Civil War. Try to find the timing around mid-late July 1865 and you may find some of the woodcuts that were produced during that period that the executions took place. It may help you to piece together the entire series of ‘images’ used to show the executions in newspapers and other publications. If I can be of any more assistance, please let me know. Hi — when is your book coming out? Hi Pam: We are anticipating a fall release. If you would like to be kept up to date on our progress, write me at outreach@awesometalks.com and put “BOOK” in the subject line. Just ask to be put on the list and I’ll add your name to it. As information becomes available, I will send out updates to that mailing list. Also, if you are interested, join our FACEBOOK PAGE at INSIDE THE WALL. You can find the link on the upper right hand side of this blog. This is somewhat gross, but I have been puzzled by it for some time. In the early picture of the empty scaffold, the nooses hang at a much higher level than they do in the “All is Done” pictures. Is this because the ropes stretched out during the execution, or were they adjusted prior to the drop? I’m looking forward to your book, and its creepy, fascinating subject matter. Hi Carl: Thanks for your comments and keen observation. Yes I agree, the analysis of these photos is somewhat gross. We see executions and death re-enacted on TV and in the movies every day. People are taken aback when they view these photos and realize that they are witnessing four people actually being hanged to death. It is a sobering observation. To answer your question, the difference between the two photos shows a considerable difference in travel of the rope (over 3′ to 3′-6″ longer). How is that possible? The truth is that it is a combination of noose adjustment and rope stretch. The rope used to hang the conspirators was a 31-strand 5/8″ Boston hemp obtained from the Navy Yard. Out of the approximate 36″ to 40″ of rope length difference, almost 14″ to 16″ may be accounted for by rope stretch (20% to 30% of stretch is possible). However, the remaining 22″ to 24″ comes from a combination of slack taken up by the loosely tied rope around the crossbeam and the noose itself. 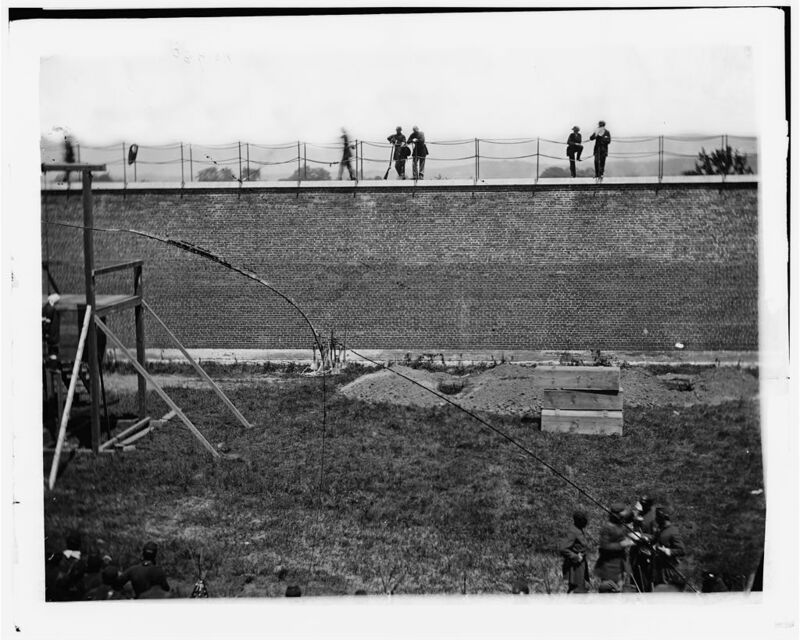 As you will notice in the photos, any noose in The Empty Scaffold is quite large so that it can easily be slipped over the head of a prisoner. If you could measure the length of rope that is located just below the knot (noose), it would probably measure about 36″ long. I haven’t done that analysis yet but it is possible. Assuming a neck is about 16″ to 18″ on average (shirt collar size) than what is left after the ropes have been adjusted prior to hanging is around 18″ to 20″ of additional rope for the drop. Take this measurement and Include some additional rope taken up by the compression of the rope around the neck after the drop (I know, I know…this is gross) and add the tightening of the loosely tied rope around the crossbeam and finally the rope stretch, then it can all easily add up to over 36″ of additional rope extension. Forgive me for the over analysis but that is how the rope increased in length by so much. Excellent forensic question Carl. Thanks, Barry! I appreciate your going into such detail about the various factors involved. Again, creepy but fascinating! I am a Civil War Reenactor/Living historian. I worked on the execution scene of THE CONSPIRATOR (Robert Redford film) in the Fall of 2009. Great effort was taken in constructing the gallows (to match the original photos. We shot at Ft. Pulaski, GA. The gallows were oriented into a corner of the fort to match the “long wall”, however, there will be much C.G.I. work done to further match the original details. I will never forget the feel and look of the execution as the bodies hung, swinging — time seemed to slow down — and it seemed we were looking at the ACTUAL SCENE. I’m certain it will read beautifully on film. Hi Larry: I too attended the execution sequence in Savannah. I was down there as a guest of the producers. I agree with you that if they choose to try to recreate the brick wall behind the scaffold then CGI will definitely be required. The wall at Fort Pulaski had large brick arches where as the Arsenal Penitentiary was a solid brick wall. Fort Pulaski was designed by the same designer who did Fort Jefferson in the Dry Tortugas (the site where the remaining four surviving conspirators were sent). Regarding the scaffold and other details I observed during my two days on set, was that there was a certain amount of artistic licence taken regarding the shoot. The scaffold looked authentic, but in fact was overbuilt with beams that were twice as large as the original. A couple of reasons for this was safety concerns as well as accommodating the cable system required to reset the traps. 90% of the photos used by the folks on site were taken from this site with permission. When the film finally makes it debut at the Toronto Film Festival in September, people are going to be pleasantly surprised. However, I’m sure Lincoln Conspirator research purists will raise an eyebrow or two when it comes to the details shown in the final execution sequence. Some parts were done wonderfully, but others were changed for artistic reasons. Let’s hope it finds a following and people become interested in the story of Mary Surratt and Frederick Aiken. I had read long ago that Rath kept much of the scaffold and sold/gave the pieces to others. I have the source somewhere in my office if you wish. I imagine you with your research probably have the book already. Hi Mike: I have heard that before but never seen the source of the story. There are many things that conflict with that version which would make me think that this was not the case. However, what we have found about the history of the Lincoln assassination and everything associated with it, is that there are many contradictions to what is currently believed to be the ‘true’ history of the event. For something so prominent in history, it is amazing how many rumors and send hand stories became accepted history. The research for our book, and research shared by others with us, have shown time and time again, that the ‘accepted history’ is mistaken or guessed at. So I’m very interested in reading the source that you have. I appreciate the offer to share it with me and I’ll contact you by email shortly. Hi Helmy: Thanks for your comment. These are powerful images that provoke a lot of emotion. I’ve seen these for years but now that I’m writing a book on the subject with my writing partner from San Antonio, we have dug a lot deeper into them. For the past two years now Iwe have researched and analyzed these ten photos with a fine tooth comb and still find new and surprising information in them. We are really looking forward to sharing our findings with everyone when the book is released sometime this spring. If you are interested in signing up for updates on our progress, just write me at outreach@awesometalks.com and in the subject line say BOOK. I’ll add you to the list. Barry please let me know if your book is out as yet. Hi J.W. Thanks for your interest in our book. For those of you who do not know yet, John Elliott (San Antonio) and I partnered up about 1-1/2 years ago to write this book. We are getting close to completing it. I will send you an email on the details. I too was down for the shooting of the hanging, and the Jailed actors scene. I know im not alone in researching the details of that grizzly day, especially after reading your rope stretching explaination! Anyway, i couldnt agree more about the artistic liscense taken in several aspects of the shoot. Anyway, the one thing i would have loved to have seen was how the platform was actually knocked out, not as it was filmed. It would also have been nice to see the story of the individual holding onto the left support in the photos as he becomes ill in the July heat, but i know its not to be! I look forward to your books release and the release of the movie. Hi Josh: Thanks for your comments. I am not a Lewis Powell expert but will pass on your question to a couple of people who are much more verse in his history than I am. I’ll write you at your email shortly. Happy New Year! Thanks for your respnse to my previous comments and questions. I do have on more for you. During the filming some of us were studying the images taken on the ironclad and the hanging of powell. My question is this (and if its covered in your book then dont answer it here lol) When Powell comitted the crime he paid for with his life did his clothing become so bloody he had to change? What i mean is this, in the photos he appears to be wearing Naval Issue clothing. If you compare his shirt hes wearing to a civil war naval “jumper”, they apear to be the same. Can you confirm this? Or is this something you haven’t even thought of? IM Just curious since we had discussed this in great deal. Thanks for your time and information. Hi Josh: You and the guys on site have a good eye for Naval outfits. Powell was photographed twice by Alexander Gardner while on the USS Montauk and USS Saugus during his captivity at the Navy Yard. Initially he was photographed wearing the outfit he supposedly wore during his attack on William Seward. It is an overcoat and hat. What I have always found interesting is that those photos show no sign of blood on them and were likely not the real McCoy. Secondly, when captured at Mary Surratt’s residence several days later, he was not wearing this outfit. He had changed. No one knows whatever happened to the bloodsoaked clothes that Powell wore that night but he obviously disposed of them. The second time Powell is photographed by Gardner on April 28, 1865, he has been changed into a naval outfit. It is well documented that he was given this clothing by his military captors. So you are absolutely correct. It was a navy blue top with blue pants if I recall. I found this page after viewing Robert Redford’s “The Conspirator,” in part because in that film the one shot showing the photographer at his camera had him dressed and bearded in a way that made me think it was Mathew Brady who recorded the hanging. Googling “Photographer of the Lincoln Conspirators Hanging” to find out if it was him led me here to learn it was Alexander Gardner. Thank you for gathering his images together and sharing them here. Hi Will: Thank you for writing. The Conspirator is going to get people interested in this period of history. The film itself was received by the research community with mixed reviews (the biggest complaints being that some of the facts were changed for artistic reasons). I was on the set for two days when it was shot in Savannah, GA. I witnessed numerous (but minor) changes to the historical record for the sake of ‘telling the story’. My personal opinion is that, because this is a film, and not a documentary, taking artistic license in small ways, to help tell a story that people can understand, is fine. I thought they did a great job on that. However, if you have the DVD, there is a documentary included which should have been much more accurate in telling the historical truth. It does not. It is riddled with falsehoods and inaccuracies that tarnish the validity of the piece. It’s a shame that people who are not well versed in the historical record of the trial and assassination aftermath will take this documentary as truthful. Shamefully, it is far from it. Regarding your other comment about Alexander Gardner and Matthew Brady, it was good that you asked that question. Brady is often credited with many of the civil war photographs taken at that time. In fact, Gardner used to manage his Washington studio for him during the early part of the Civil War. It was common practice for the owner (Brady) to put his name on all photographs shot by other photograpers in his employ. Most of the images credited to Brady were not actually shot by the man himself. That was the proper business procedures of the day. Alexander Gardner left Brady in the early 1860s and started his own studio in Washington. Unlike Brady, he credited the photographers who worked for him. In the case of the executions of the Lincoln Conspirators, Gardner and his assistant, Timothy O’Sullivan shot the images from July 7, 1865. Currently, ten are known to exist. In the film, Gardner is shown standing on a wagon with his camera taking the pictures. In fact, he was located on the 2nd floor of a building in the prison yard. But the budget to recreate a building for the sake of this final scene was likely not there, so this was a ‘good’ alternative I thought. On the other hand, the film’s documentary talks about building the scaffold using square head nails to be as accurate as possible to the original. Personally, that is an incredible waste of funds considering the camera would never pick up that detail. And square head nails today are not cheap. Much of my photographic work was used as references by the film’s production staff. One of their researchers contacted me several months before shooting was to begin. I had an analytical presentation of the photographs on this blog at the time which they found. I gave them permission to use my work but the photos didn’t tell the whole story and their interpretation of them was incorrect in some cases. For instance, the scaffold for the film was built using much larger beams than the actual one. This was done for both structural sake and to hide the mechanisms used to reset the traps during the hanging sequences. The hanging sequence was shot 4 times on set. So as mentioned earlier, changes in historical detail are not always followed for reasons not known to the final viewer. Sometimes it’s technical reasons, sometimes it’s artistic reasons and sometimes it’s ignorance of the subject matter. I personally believe that the American Film Company and Robert Redford did a good job in telling this little known story of the assassination and it has sparked interest of many people to find out more about it. The documentary that they have used is an entirely different matter. okay, my question is why would they leave the bodies hanging after 25 minutes? just wondering because i am doing a research project. Hi Bradie: Thank you for your question. When someone is hanged, death is caused by strangulation and very rarely results from any other injuries. 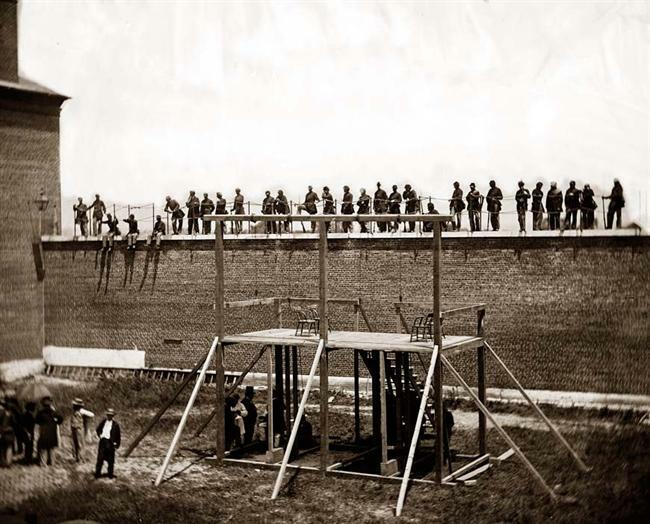 In the case where a drop is used (as in the case of the Lincoln conspirators who dropped about 5 feet before they reached the end of their ropes) the hope was that the downward momentum of their fall was sufficient enough to break their necks and render them unconscious. Unfortunately for two of the four conspirators, they remained conscious and suffered ‘hard’ deaths. What might surprise you is that the actual ’cause of death’ was the same for all four prisoners. Death by strangulation. Death resulting from a broken neck is rare in hangings (although the shock of it has been known to stop the heart in some cases). Usually, the real cause of death during a hanging is strangulation. If a victim is lucky enough to lose consciousness after the drop, they are assumed to die quietly by suffocation while hanging there. The noose cuts off all oxygen to the lungs and brain and they eventually die. The condemned Lincoln Conspirators were allowed to hang about 15 minutes or so before the doctors first checked for signs of heartbeats. They declared all four dead but decided to let them hang an additional ten minutes just to be sure they were dead. I’ve enjoyed all the posts, the information imparted and your kind responses. I am heading to DC and hoping to see these sites. Do you have any additional suggestions of places to see in relation to the conspirators? Hi Diane: Thank you for the kind words. I was just finishing up a lengthly response when our system crashed and I lost it all. So in brief, here is what I can suggest regarding visiting Washington and doing things related to the assassination and conspirators. In no particular order. 1. Surratt House Museum, Clinton, MD: This is the location of the tavern that was owned by John Surratt Sr. and Mary Surratt. During their run from the assassination on the night of April 14-15, John Wilkes Booth and David Herold stopped here to pick up weapons. It is also the home to the Surratt Society, a major gathering place for researchers and those interested in knowing more about the assassination of President Lincoln. Laurie Verge (Director) and her staff are a wealth of information and always happy to share their knowledge with you. Clinton is about 20 miles south of DC and can be reached by car or subway/taxi. Go to their website for more info. 2. Ford’s Theatre, 511 Tenth Street, NW, Washington, DC 20004 as well as the Petersen House (just across the street) and the new Center for Education and Leadership (museum)(also just across the street). Ford’s is the place of the assassination and the Petersen House is where Lincoln was carried to where he eventually died. 4. Booth Escape Tour: This is a full day tour that retraces the route John Wilkes Booth took over a 12 day period after the assassination of President Lincoln. Speak to the folks at the Surratt House (in advance) as they host this bus tour. 5. Ft. McNair (military base and college). Okay, this one is a little bit trickier. This is the location where the Arsenal penitentiary stood and where the conspirators were tried, incarcerated and some of them executed. You need to sign in at the gate and indicate that you are going to visit Grant Hall (Building 20) or the University Library. Regrettably, this is a military base and so there is no guarantee that you will be let in. If they do let you in, you can find the location of the last remaining part of the penitentiary still standing (known as Grant Hall or Building 20). On the third floor of this building was where the conspirator trial was held. It is currently under construction to restore it to the look of the original trial room. They are behind schedule and so there is no firm opening date for it (and a resolve on how they will let the public in to see it). To the south of the building are four tennis courts. The execution of the four conspirators was located here. Just off of the playing surface of court #4 is the location of the scaffold. Northeast corner. Other things of interest there are the Model Arsenal building (Building 21) which is south of Building 20. Alexander Gardner took his last shot of the execution from the top of this building. 5. The location of Secretary of State William Seward’s Residence in Lafayette Square (no longer there) where the attack on his life by Lewis Powell occurred. The property is now occupied by the US Court of Federal Claims building. However, if you want to see a home very similar to the style of the original Seward House, visit the Decatur House (which is open for tours). It was constructed in the same Federal architectural style and also has the attached slave quarters. It is across Lafayette Square from where the Seward Home once stood. The interior of Decatur House is very similar to that of the Seward Home. I hope this is a good start for your tour of Washington. Hi Kelly: Good to hear from you. I spent two days on the set of The Conspirator when the shot the executon scenes. They were shot at Fort Pulaski, in Savannah, Georgia. It is an old Civil War fort. The did not change the fort to accommodate the original Gardner photographs. It was close enough in look to work in the film. Alexander Gardner actually took his photos from second floor of a building located in the middle to penitentiary south yard. But since they did not have a building to duplicate it, they used a wagon instead and showed him set up on top of it. These are compromises (mostly for cost reasons). History suffers for it but the movie still got finished, even though it was not exact in the facts. 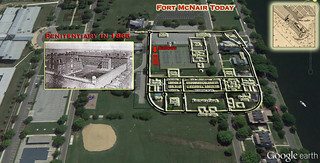 I am a historian who works on Fort McNair and plays soccer on the field just south of where the executions took place. I made a Google Earth overlay to show where the Old Arsenal Penitentiary used to be. It’s not precise- banged this piece out in just 15 minutes last night- but reasonably close I think. Would appreciae Title of Book; purchase source: etc. I am interested in Lincoln material: Pastor; 77 yrs old; Doing Christian Book on Devils Den. Thanks for any help. Hi Pastor. The book we are working on is called “Inside the Walls: The Final Days of the Lincoln Conspirators”. It is about the incarceration and punishments of the Licnoln Conspirators. Currently the book is not finished however we have published a couple of supplements which feature chapters from the book. We are selling these by request and you can read about them in my blog. Look up A Peek Inside the Walls: The Final Days of the Licoln Conspirators. Write me at outreach@awesometalks.com and I can send you a quote. They are sold for $8.50 each plus shipping/handling. Hi Barry – I enjoyed reading the thread above – it’s great to see your detailed responses to readers’ questions. When I was a kid my dad was attending the War College and I learned to swim in the Ft. McNair pool. I had also tried superimposing old maps with current satellite views (prior to stumbling across this page) and was also convinced the gallows were in the east tennis court area. In reading James Swanson’s book “Manhunt,” I noted that he said that Booth was quietly buried inside the walls of the Arsenal for a short period of time, before the body was removed to go to the family plot in Baltimore. Do you agree with that, and do you have any idea where that would have been in relation to current topography? Thanks! Hi Dave. Great to hear from you. I can help you on this question for sure. Just after Booth’s body had been autopsied on the USS Montauk, his corpse was taken over to Green Leaf point (the southern tip of the Arsenal grounds. This was done about mid-afternoon on April 27. The body was temporarily stored in a cottage there until about midnight when a small procession of people (including Asst. Surgeon George L. Porter) escorted the body from the cottage to the penitentiary. The body was taken into the western part of the penitenatiary in a storage area just west of the jail cells and just east of the Adminstration offices (at the far west side of the building). There, in the southwest corner of that storage area, a shallow hole had been dug and Booth’s body deposited. It would remain there for two years until in 1867, the penitentiary was to be torn down. So Booth’s body, along with the four executed conspirators (and the body of Capt. 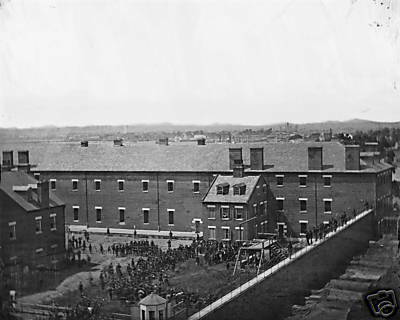 Wirz) who were all buried in the south yard, were moved into Warehouse 1 on the eastern side of the arsenal grounds. There all six remained until 1869, when the outgoing President Johnson released the bodies to their families. Thanks for the prompt and detailed response Barry! Can you refer me to a map of the original buildings? The only one I have been looking at is the one that Dr. Villard used (above). Can’t wait to get back to DC and visit the Grant building and go to the Surratt Society! Hi Dave: My research partner John Elliott and I have been working on the history and photo analysis of the conspirator incarceration and punishments for several years now. We have a book in the works (although it seems our real jobs keep us for nearing the finish line on that one). But we do keep finding interesting ‘history changing’ information and that has been a fun part of what we have been able to accomplish. If you are thinking of heading down to the see Grant Hall, as you know, the trial room was recently restored on the third floor. John informally shared a lot of our research with the Army Corp of Engineers who were charged with transforming the old room back to its former self. It is not open to the public on a daily basis and arrangements need to be made in advance to make sure you don’t waste a trip there and not get in. If you are planning a trip to Washington or Clinton, MD (where the Surratt House Museum and Surratt Society resides) perhaps look at coming to their conference in March (I think it is March 14-16 this year). Both John and I will be speaking again (our third time in four years). It’s a great weekend with bus tours to local historical haunts or battlefields, and a full day of presentations on different aspects of Lincoln’s assassination. I’d love to see you there. Dave, regarding the orientation of the penitentiary building compared to modern day Fort McNair, I have done extensive layouts and plans of the site but cannot release the info just yet. However, a couple of years ago, John was given permission to ascend to the top of the Model Arsenal building to take photo of Grant Hall. The angle of the shot is almost identical to the shot taken by Alexander Gardner from the rooftop of the same building of the executions on July 7, 1865. Our facebook page “Inside the Walls” has a nice overlay of the original arsenal photo and John’s photo. We work very hard at presenting only accurate information (as there is so much that is not accurate out there). The plan will be published soon. Please tell me how to sign up for the Mary Suratt full day tour of Booth’s escape route. Hi Lillian: Thank you for writing. Go to the Surratt Museum website with this link (http://www.surrattmuseum.org/su_bert.html) and it will give you that information. They only run the tours in a scheduled format. I believe all of September is sold out already. At this time, I do not know if they have any for October. If you can’t find the answer, the folks there are extremely helpful and can give you all the info you need. Why were the shoes taken off the conspirators before they were hung? Hi Doug: Thanks for your question. I’ve been asked that question several times in the past few years and it’s a very good one. In all the research I’ve done on this subject since 2008, and in subsequent conversations I’ve had with other experts, no one has come across any hard evidence to support a definitive answer for your question. But here is what I can tell you. The Gardner photographic evidence verifies some information. For instance, only the three male prisoners wore socks or slippers to their executions. Mary Surratt, the lone female prisoner wore her own shoes that day. All four of the prisoners’ footwear can be clearly seen in close ups of the execution photographs after the traps had been sprung. My best guess as to why the men wore their socks or slippers was that this is what they were wearing during the last night of their lives. They got very little sleep and spent the majority of their last night in new cells (they were moved the day before from their existing cells to ones on the first floor) visiting with family and their spiritual leaders. If they had any shoes at all with them (after they were moved) they likely relaxed in their cells with their guests in their socks and/or were given slippers as a gesture of decency by the commander. But this is just a logical guess on my part. I believe that they were given these after being settled into their final cell locations. To me this is very plausible. I would suspect that if they had chosen to wear their shoes, they would have. Mary Surratt did, but she was a lady and to dress properly in those days was not only expected by part of one’s upbringing. Her daughter was with her right up to the end and so I’m sure she assisted her mother in dressing for the execution. We know that Lewis Payne gave away some of his personal belongings to his minister (including the copy of his death warrant) just prior to his execution. For someone in possession of few personal belongings perhaps his shoes would have been a part of that gift. There is no mention of this though in known documents. And for all we know, David Herold may have given away everything he had to his sisters who visited him most of the night. I would suspect that unless there was something absolutely essential for the prisoners to take with them onto the gallows, I believe shoes would have been the least important thing on their minds. Thank you for your response. In the movie “The Conspirators” the execution scene focused on taking off their boots….artistic license, but why? It also focused on removing their hats. Were they wearing hats to their execution…and if so, where are the hats now? A glaring error in the movie is that Payne is the same height as Herold and Atzerodt. Thanks Doug. I’m very familiar with The Conspirator as I did some consultation work for the production and was actually on set for three days for the filming of the execution scenes. As in most movies and many, many documentaries, artistic license is a problem for historians. The execution scenes were shot at Fort Pulaski in Savannah, GA and although the fort has a similar look to the south yard of the Arsenal Penitentiary in Washington, it is not exact and changes were needed for that too. Let me address some of your observations. 1. Taking off the boots – complete fabrication. From the moment the prisoners entered the yard until they were buried, there footwear was not changed, removed or altered. They wore what they had on from start to finish. But as I said yesterday, since there is no hard evidence about the shoe story, the film makers interpreted it in their own way. Although incorrect, they still wanted to make a point that the shoes were not on their feet when the traps dropped. 2. Hats – Mary Surratt wore a black bonnet with veil. Lewis Powell initially had no hat but was given a straw hat as he entered the court yard. David Herald wore a floppy hat (don’t remember the exact name of the type) and George Atzerodt had a kerchief tied to his head by his minister Rev. George John Butler. All four prisoners were treated with kindness and dignity in their final hours and protecting them from the heat of the sun was part of that. After their sentences had been read and the ministers said their prayers, there was nothing left to do but stand the prisoners up, remove their hats and place the nooses and hoods over their heads. 3. Where are the hats now? I am not aware of any record existing which identifies the whereabouts of the hats for all three men. However, there is a museum in Andersonville, Georgia called the The Drummer Boy Museum that may have Mary Surratt’s bonnet (without veil). This museum is small but received to its collection many years ago, the contents of a truck containing General Eckert’s documents. In it was this bonnet that was identified as being the one Mary wore on the scaffold. No firm providence exists for the bonnet but the Eckert papers have been verified. So if there is ‘guilt by association’ or ‘trust by association’, then this could indeed be the bonnet of Mary Surratt. 4. One of the biggest complaints that came out regarding Robert Redford’s film was that his casting was not very good when it came to look-a-likes. Speilberg’s Lincoln did a far better job at it for sure. Case in point is your observation that the actor playing Powell (Norman Reedus) is the same height as the actors who played Herold and Atzerodt. It is true. But you must remember that the focus of the film was not on these gentlemen but on Mary Surratt who was played by Robin Wright Penn. By the way, critics also said that she was too young and too pretty to play the role. I’ve made a professional study of the executions and incarceration of the conspirators since 2008 and will be speaking and giving tours at Fort McNair on May 8/9 when the 150th anniversary of the start of the trial is celebrated. The trial room was restored over the last two years and on Friday, May 8 there will be a VIP night and then on Saturday, May 9 it will be open to the public. Fort McNair is an active military base so security is always tight. The public showing of the trial room and the locations of where the executions took place is a rare event. If you are in the area, you should definitely try to attend. I attended the commemorative today and thoroughly enjoyed it. Acting on your suggestion to view the ten photographs, I was intrigued by the question of the existence of additional photos from the execution. I have visited several museums recently and recall seeing a photo of the four bodies on top of the coffins, or burial crates, being examined by doctors. I can’t recall if this was on display at Ford’s Theatre, Smithsonian, or some other DC exhibit, but it was from the same perspective of the scaffold photos. I may go out tomorrow and retrace my steps to see if I can verify my recollection. I’ll let you know if I can track it down, unless you are already aware of what I refer to . Hi Scott: Thank you so much for your email and thank you for this very appreciated email. I have never seen an photograph of the four bodies being examined by the doctors (but still believe that there may be one out there). However, Frank Leslie Illustrated Magazine did publish a series of illustrations depicting the hanging and aftermath and from your description, this may be what you could be remembering. If not, I’d be thrilled to see the photo if you can track it down. I’ll send you a copy of the illustration to see if it jogs your memory. Thanks again and I’m really happy you attended the 150th anniversary tour yesterday. It was my pleasure to give the tour (6 in all) along with a portion of the VIP evening presentation that was held the night before. I came hope with good feelings from the event, a great sunburn and a few stiff muscles from all the standing I did. But it was wonderful and the folks that came out to visit the site were great and full of interest and questions. I hope I was able to fill in some information that was new to you. And thanks to folks like you who can act as my eyes and ears to new information, I’m always learning something new myself. I look forward to hearing more back from you. Thank you for the quick response. I was beginning to question my memory and returned to the Pederson House before I saw the illustration you sent. You’re right, that is the image I was thinking of. It is displayed next to the execution photos on a story board. While I was there I met one of the Board members of the Studebaker Museum that owns the carriage Lincoln rode in to the theatre. It’s currently on loan to the Smithsonian, and on display on the first floor. This has been terrific to be able to see all these artifacts in DC at one time. Hi Scott. It looks like it was such a worthwhile trip for you. You got to see a lot in a short period. And thank you for letting me know that the Carriage is on loan to the Smithsonian. I didn’t know that. I was at the Smithsonian to drop off an artifact to them on Friday and would have like to have seen the carriage had I known. Oh well, next time. Have a great day. I was intrigued by what you had to say about the shoes of the co-conspirators, as it touches on an old family mystery. Here is the essence of the story. My gg grandfather was in the Veteran Reserve Corps (10th Regiment, Co. A) and was stationed in Washington DC at the time of Lincoln’s assassination. He died in 1918. A very puzzling sentence in his obituary is as follows: “He was one of the guards of the assassin of President Lincoln and he cut the murderer’s shoes into strips and gave them to his friends.” We have no evidence as to whether or not this rather extraordinary statement is true, although I should note that other biographical details given in his obituary have subsequently been verified. I don’t think the “assassin” referred to could have been Booth, as I understand that his boots are accounted for (one buried with him and the other on display in the Ford Theater Museum.) If there is any truth at all to this story then perhaps it has something to do with the co-conspirators. Is there a chance that my ancestor had access to the shoes of one of the co-conspirators? Are you aware of any similar stories? Hi Linda. That is an amazing piece of information and although I have not heard this before I wouldn’t put it out of the realm of possibility. Assuming the obituary is correct in that your GG Grandfather was involved in guarding those involved with the Lincoln assassination, I would say that the other info you’ve shared with me would help to support this. I agree with you that Booth was killed in the field and never had a guard on him (and that his boots are accounted for) so that the person who wrote the obituary likely misspoke (which is quite common if you don’t know all the details of the assassination). But what does help support your assumption that he may have guarded the conspirators is that he was with the Veteran Reserve Corp in Washington. The VRC was involved in guarding the conspirators while they were held at the Old Arsenal Penitentiary during their trial and afterwards. 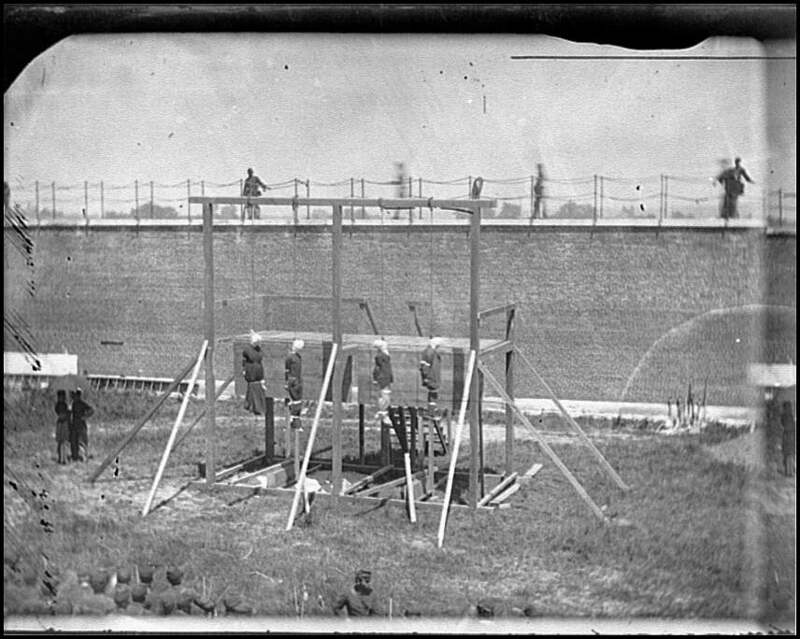 As four of the eight conspirators were executed on July 7, 1865, the three men who went to the scaffold did not wear their shoes. We assume that these, along with other of the few personal effects they left behind, could easily been taken by people with access to the cells. The papers stated that a day after the executions, family members were invited to come back to the penitentiary to pick up their loved ones belongings. Whether the shoes were still there after that point or not, we will never know. I would tend to believe that if your GG Grandfather’s obituary is correct, the shoes were probably taken just after the execution and sold later. There are many stories of souvenir hunters taking all sorts of things related to the execution and selling it later. And there are some wonderful stories of soldiers buying rope similar to the ones used in the executions and cutting them up into little pieces and selling them for $0.50 each. Please email me your GG Grandfather’s name and if you have a copy of his obituary, I’d love to see it and add it to my collection of research. Thanks Linda. I’ll look for it and get back to you as soon as I can.